Switching to a virtual phone system can be tricky. And if you’re reading this, you’ve likely seen that even a strong, stable internet connection is no guarantee of a seamless experience. So to get you back on the road to reliable call quality, we’ll outline the most common VoIP issues and offer no-nonsense troubleshooting tips for each. To understand what could be going wrong, it’s important to understand — from a high level — how VoIP calls are made. When a VoIP user speaks into a microphone, that raw audio is converted into a digitized stream and compressed into data “packets” ranging from 10-40 milliseconds each. Those individual packets are transmitted sequentially through the user’s device, the router, and the VoIP software’s media server (e.g. Twilio or Plivo). This process continues through a carrier network, all the way to a recipient’s device, then repeated in the reverse direction. This multi-step journey presents plenty of opportunities for things to go wrong. You can’t personally step in and fix issues with the carrier or the recipient, but other hiccups can be addressed. The dotted-line box in the image above describes which phases of the call process you can influence directly. That’s where we’ll focus our attention. Audio latency (delays) can occur when the raw audio is being compressed or when the compressed audio is traveling through the initial provider network (Twilio, etc.). Latency won’t affect the quality of the audio, but it will throw off the delivery-timing. In the most pronounced cases of latency, call participants will “speak-over” one another, with the audio arriving at the recipient’s device at irregular and awkward intervals. Jitter occurs when packets are delivered to a recipient at irregular intervals. Audio must be played at a constant rhythm to be intelligible, so any discrepancy will be noticeable in conversation. VoIP service providers may build in jitter buffers, but sometimes latency will go beyond the buffer’s capacities. If this happens, you’ll hear missing or “skipped” audio (if the packets are being delivered too quickly) or lapses of silence (to account for slow packet delivery). If packets are lost, delayed, or contain errors, the network may drop and abandon them before reaching their intended destination. This is usually due to bandwidth restrictions or an unreliable internet connection. The result is missing chunks of audio. In reality, these issues are somewhat interconnected and rarely happen in isolation, and a high-speed internet connection alone won’t necessarily solve your VoIP issues. Your network needs to be properly configured in order to get the absolute most out of your phone system. Sorting out and optimizing your network is a serious endeavor, but with informed planning and guidance, it only needs to be done once, and you’ll see the benefits immediately. It goes without saying that without sufficient bandwidth, VoIP call quality will always be at risk. Voice packets travel through many stages before they reach a recipient, including access points, routers, switches, and more. Every step is a potential bottleneck and source of frustration. Network prioritization is your ace-in-the-hole to do away with VoIP issues. When users on your network use multiple applications simultaneously, this uses bandwidth and clogs up your network, like a highway during rush hour. If lanes aren’t properly designated, congestion will quickly build up, and traffic will eventually slow to a stop. Think of network prioritization as adding carpool, emergency vehicle, and “Exit Only” lanes to our metaphorical highway. (Also, assume this is in a world where traffic signs are actually obeyed.) Reserving space for specific purposes won’t eliminate traffic congestion completely, but it will allow high-priority vehicles (whether apps or ambulances) to travel unhindered when necessary. With network prioritization, you can designate a few lanes (i.e. bandwidth) for VoIP only. This will make sure there’s plenty of space for your conversations to maneuver. In the industry, this earmarking process is called Quality of Service (QoS). It ensures voice packets have higher bandwidth priority than other data packets. Setup requires configuring your router’s bandwidth specifications. This task can be a bit complicated and should be done by an IT professional. (If you’re using Aircall’s VoIP software, we can remotely configure your router for you). The graphs below show how an Aircall client reduced latency and packet loss after setting up QoS on their router. Maybe it’s just us, but we think that’s one of the most beautiful before-and-after pictures on the entire internet. Most expensive, professional-grade routers need to be manually configured. Wifi was never designed with real-time applications in mind. There are likely many internet-connected devices using your WiFi network, competing for bandwidth. Using WiFi for VoIP calls usually produces acceptable results, but an ethernet connection will guarantee the highest quality connection. Ethernet also helps bypass the problem of interference. Smartphones, microwaves, and even fluorescent lights near an audio input can cause popping, crackling, or humming noises during your call. Solving VoIP Issues: How’s Your Headset? 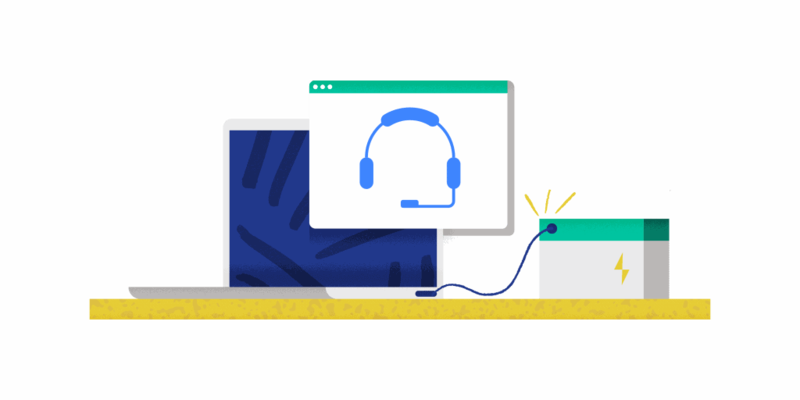 They may not look like troublemakers, but headphones are responsible for more VoIP issues than you might expect. As headphones become more technologically sophisticated, they also become more complex. Some headphones will disconnect from phone apps if the user stays silent for too long, and others will refuse to be recognized by certain operating systems. Sound distortion and one-way audio can occur when a headset microphone picks up the incoming audio. Most VoIP providers will recommend a professional-grade option they know will work with their software (Aircall’s go-to is the Jabra Evolve 40). This guide isn’t exhaustive, and VoIP issues are sometimes difficult to replicate, diagnose, and fix. At Aircall, we want each and every one of our users to have an easy time using Aircall, which is why we’re always trying to improve. If you’re encountering an issue we didn’t detail, feel free to check out our FAQ or reach out to our support team, support@aircall.io.